What's the Connection Between MS and the John Cunningham (JC) Virus? The risk of PML is higher in people who take certain medications to treat multiple sclerosis. The JC virus, is a typically harmless virus. It is found in the blood samples of 70 to 90 percent of people worldwide. Children with JC virus often show no symptoms. The JC virus can also be found in the body much later in life without complications. It is commonly found in the kidneys, bone marrow, and some body tissues. According to an article published in the World Journal of Neuroscience, the virus "remains on renal tissue and can be eliminated in urine in 40-75 percent of individuals around the age of 30." JC virus is typically a harmless infection. 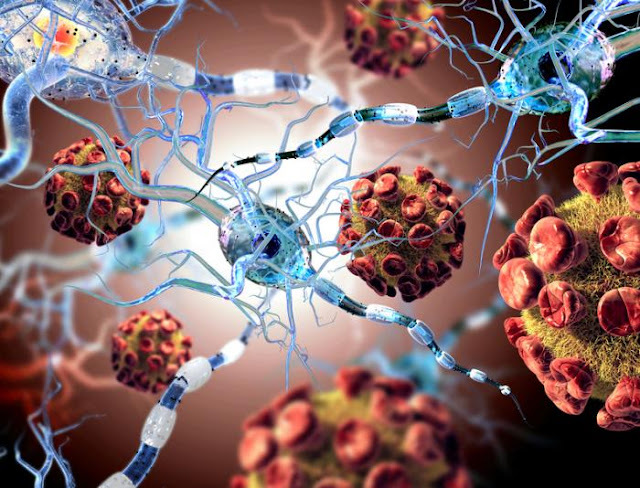 However, some people with the virus are at a high risk of developing a potentially life-threatening condition called progressive multifocal leukoencephalopathy (PML). In PML, the protective coating of the nerve cells breaks down, causing damage to the central nervous system. The risk for PML increases in those whose immune system is depressed, such as with an HIV infection or receiving certain medications to treat autoimmune conditions such as multiple sclerosis (MS). The JC virus that is dormant in the body can reactivate and cause infection. This reactivation of the JC virus and development of incurable PML can lead to severe physical effects. Complications include dementia, blindness, paralysis, and seizures. Up to 50 percent of those diagnosed with PML die within the first few months receiving a diagnosis. Why are people with multiple sclerosis at risk for developing PML? For those with MS taking the medication natalizumab, the risks for reactivation of the JC virus and progression to PML are elevated. A study published in the New England Journal of Medicine evaluated 19 patients with MS receiving treatment with natalizumab. The researchers found a rise in JC virus urine levels after starting treatment with the drug. Virus levels rose from 19 percent to 63 percent after 12 months of using natalizumab. After a further 6 months, blood samples further revealed that the virus had entered the blood cells of 60 percent of the patients. The researchers also found that the body's immune response to the JC virus had fallen after 12 months of treatment with natalizumab. They reported that among many of the MS patients using the drug, the virus that was found in their urine or blood samples had already undergone changes linked with the virus' ability to reach the brain and cause PML. None of the study participants, however, developed PML brain lesions. Infection with the JC virus can cause cells to die. The virus can also break down the protective coating of the nerve cells, affecting the white matter of the brain. PML is an aggressive, potentially fatal disease caused by a brain infection by the JC virus. Symptoms of PML may be quick and evolve over a few weeks. They may also progress slowly, developing over a period of months, and can result in death. Currently, there is no cure for PML.